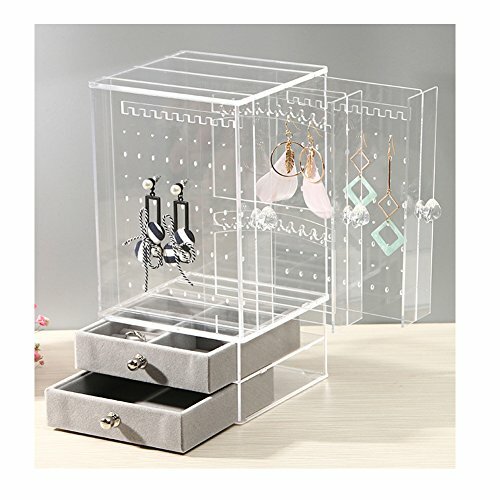 BiuTee Jewelry Organizer is finely designed and crafted with acrylic, high quality velvet and medium density fiberboard. It will help you to keep your jewelry and small things in good order with its divided slots. This large jewelry box is large enough to hold your necklaces, bracelets, rings, earrings, cuff-links, brooches, chains, and other jewelry. -Size: 10.5" x 9.1" x 7.8"
BiuTee Faux Leather Jewelry Box is a large sized jewelry box able to store large jewelry collections thanks to its multiple layers and compartments. Made of quality acrylic and soft beige velvet, attractive appearance, sturdy and durable. Size: 10.5" x 9.1" x 7.8"
The Jewelry Box includes 5 layers with 5 drawers, 2 side compartments with 10 necklace hooks, 20 compartments, 2 removable earring holders which hold up to 30 earrings (10 hanging, 20 posts) and a portable small storage box. Large enough to hold your necklaces, bracelets, rings, earrings, cuff links, chains, brooches and other jewelry. And snap closure with keys make sure of safety. Practical gift choice. Great birthday gifts for girls or women. If you have any questions about this product by Biutee, contact us by completing and submitting the form below. If you are looking for a specif part number, please include it with your message.